The first round of A Dal 2019 in Hungary is over. 18 songs have qualified for the semi final stage. But for those of you who do not have time to listen to all those songs, our chief editor & Hungary expert Steef van Gorkum shortlisted the top 6 candidates for you! The only entry so far that meets all criteria to be a potential A Dal winner, is Fatal Error. The metalband won the second quarter final which was the strongest one of all. They reached the highest total score of all, were popular with all 4 jury members ánd with the app vote. Their rock song leans heavily on the guitar solos midway, while the chorus is somewhat repetitive. 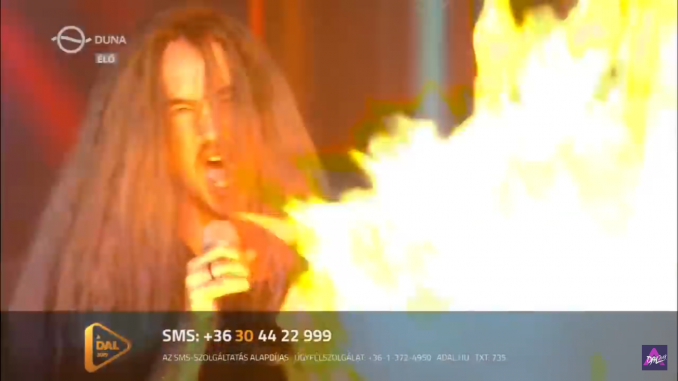 Whether Europe is as keen on yet another metalband on the Eurovision stage as the Hungarians seem to – that is a different story. A quiet acoustic guitar, a sky full of stars in the backdrop, and the enchanting voice of Joci Pápai. That is all we hear and see (and need) for the start of this performance. And then comes the chorus: which contains nothing but a quiet whistle. Very understated, very classy. Joci Pápai still needs to convince the home audience more if he wants a second try at Eurovision. However, when he won A Dal in 2017, his televote support also was not great at the start. Newcomer Gergö Szekér already has a big radio hit in Hungary on his hands, after winning the first quarter final of A Dal. His song “Madár, repülj!” is a catchy tune in which he both raps and sings –competently. While himself being a little static, Szekér makes great use of LED-screens and modern ballet on stage. Question is whether his jury support will prove strong enough as the competition gets stronger. Runner-up behind Freddie in 2016, Oláh Gergö returns to A Dal with a much more mainstream song. “Hozzád bújnék” is a classical ballad, with a strong build-up. Vocals are reliable, as Oláh is one of the best performers Hungary has to offer. He has jury support and we know he can win over the Hungarian audience when he needs to. If this goes to Eurovision, however, the staging would need an upgrade. Newcomers Acoustic Planet surprised friend and foe by finishing in 2nd place in the strong second semi final. Their point total was higher than the winnners of QF1 and QF2. This would be the biggest gamble Hungary could take if they send this to Eurovision: a lovely and quiet song, in their own language, musically and vocally strong (but not very memorable). The staging is simple: a band and a lead singer in a shiny blue dress. In the first round, Acoustic Planet was equally supported by all jurors, and they could just as easily hang them out to dry in the semi finals. András Kállay-Saunders, who brought Hungary a 5th place in the 2014 Eurovision Song Contest in Copenhagen, has since then been fighting for another chance. This year he triest he A Dal competition with his band The Middletonz. The song “Roses” is an interesting mix of hiphop, reggea and drum & bass. Kállay-Saunders is an amazing performer and a superstar in Hungary, and despite finishing only third in his quarter final, you can never write him off.